One night in 2010 Jenny and I were listening to Coast to Coast, as we normally do, and chatting on the computer. Around one a.m. she tells me she's about to eat a banana. No big deal, right? Well, a minute later I ask her how the banana is, and she replies with an expletive I can't share with you. Being one a.m. I think the worst: burglar, fire, meteor strike. But no, she explains, it's the banana. There's something horribly wrong with the banana. The inside of the banana is red. Red like pulp or blood. I ask her if she thinks the banana has been tampered with. She says no. So we try to research banana viruses and diseases and come up with nothing. The following afternoon she calls Dole and is told this happens when bananas are dropped during harvesting and it's something they hear about occasionally and offer her an apology and five dollars. But that explanation didn't seem entirely satisfying so I tell her she should contact the USDA. Which she did. They called her a few days later from the national office in Washington, DC and told her they had never heard of anything like this and are sending a local field representative there to pick up the banana, which she now had frozen. I told her not to give them the whole thing, just some of it. So, the USDA field agent came, repeated that they had never seen anything like this, and took the banana specimens. Nothing was heard from them after that. I had completely forgotten this story until a couple of days ago when i remembered the pictures and decided to write about it. I could take Dole's explanation that this happens occasionally when fruit is dropped, frozen, or sustains some sort of trauma during the harvesting process, but why wouldn't the USDA have ever seen anything like this. That's their job, right. They have experts who were completely unable to offer any explanation why a banana would appear to be filled with something that looks like dried blood. Anybody else got tales of strange fruit? Besides these guys. Let's say we're not willing to take Dole fruit at their word. 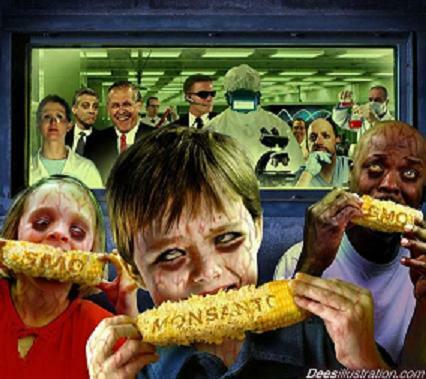 Over 80% of processed foods now contain GMO's (Genetically Modified Organisms). It's hard not to eat them. Even health-conscious people are usually forced to resort to eating GMOs because of lack of labeling information, availability or organic foods, and expense. Life is already busy enough without the added headache of having to research every morsel of food we put in our mouths. 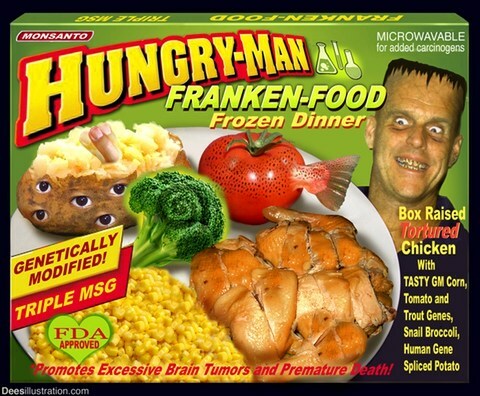 But can we trust this new Frankenfood? The answer may be as simple as asking yourself "Do you trust ATT, Exxon, JP Morgan or Monsanto." I don't. Well, let me rephrase that. Maybe I DO trust them. Trust them to be entirely human. To try and make as much money and show as much disregard for quality and safety as possible. That's the new American economic model. But do you want to eat that? I don't. But just knowing about it and wanting to eat clean, healthy, organic food is starting to become the easy part. The federal government, urged on by corporate giants like Monsanto and ADM, is cracking down on organic farmers, local markets, and producers of food that isn't genetically modified. Monsanto has actually patented life forms. Imagine that: owning a life form. Fortunately, millions and millions of people worldwide are starting to rebel against Monsanto. Which isn't an easy task because many of the heirloom seeds the planet has produced for milleniums are becoming scarce. It's possible to imagine a future where clean seeds are more valuable than gold. March 27, 2013: Seems like everyone in America was fulfilling their twice annual obligation to care about something and change their Facebook profile pic to demonstrate that they had fulfilled their obligation, this happened... Monsanto Protection Act passed while no one is watching. That was a freaky night, to bite into a thing while listening to a sort of spooky radio show and see guts. That whole bunch of bananas had "Banana Shock," what Dole called it. I never have run into anyone else who's heard of it. Ya, like the USDA, and even though they're a governmental agency, they're still experts, and they had never heard of it. That was one screwed up banana. Thanks Zombie Logic for reading my post and provding the link to yours. The B.U.G. (http://bit.ly/zbALxa) What do you know about Monsanto and chem trails? Digidanie, I'm not a big expert on chemtrails. That rather high ranking official in Russia sure wasn't shy lately about spilling the beans on their weather modification efforts, so I don't put anything past them. One curious fact I do know is that Kurt Vonnegut's brother, or was it an uncle, invented the technology for cloud seeding. Ice 9, indeed. Brains. Maybe there's still some in the freezer if you're interested. Meredith, Thank you! I've never been able to find anything else about it. Amazing. It was such a shock and I like a banana so in 30 years of eating them, I'd never seen such a thing. Thank you, Meredith. I advise anyone who looks this up online to use safe search.